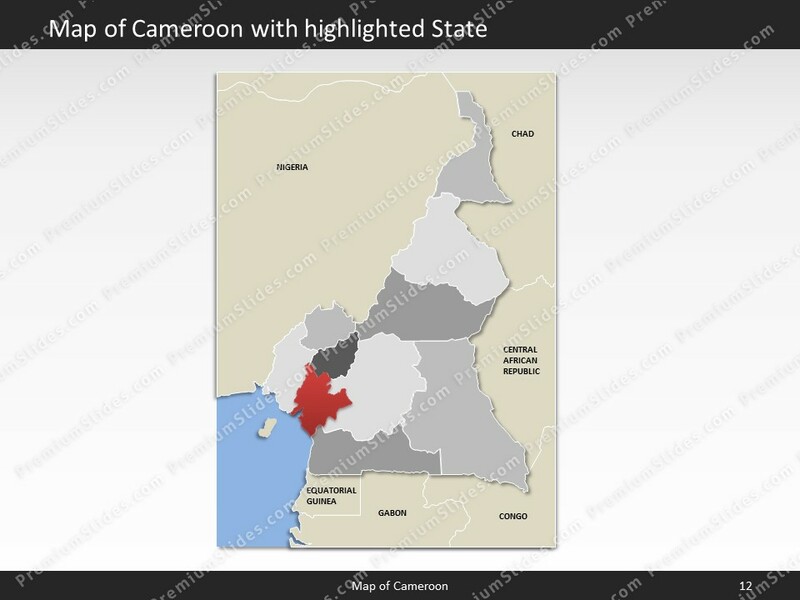 Premium PowerPoint Map of Cameroon. This detailed PowerPoint Map Template shows Cameroon states, biggest cities and the Cameroon state capital. The Cameroon PowerPoint Map is hand drawn and fully editable in size and color. 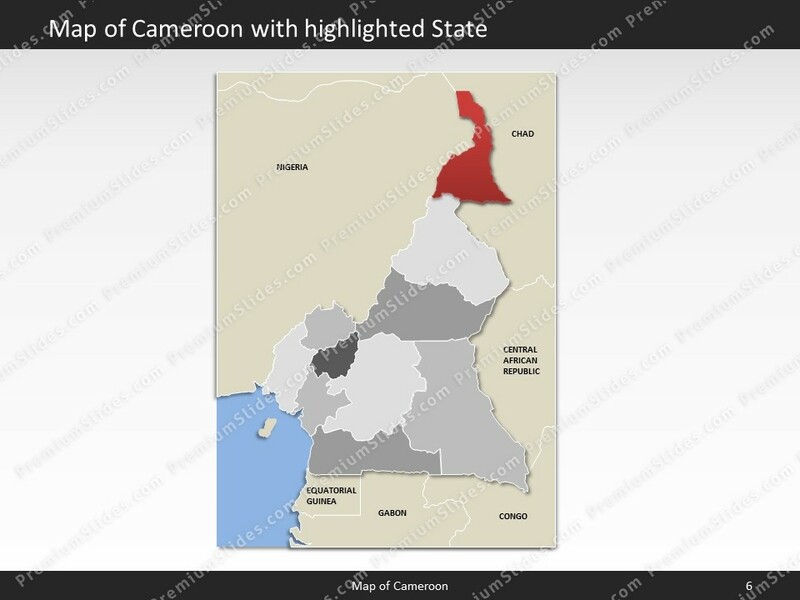 Premium PowerPoint Map of Cameroon. 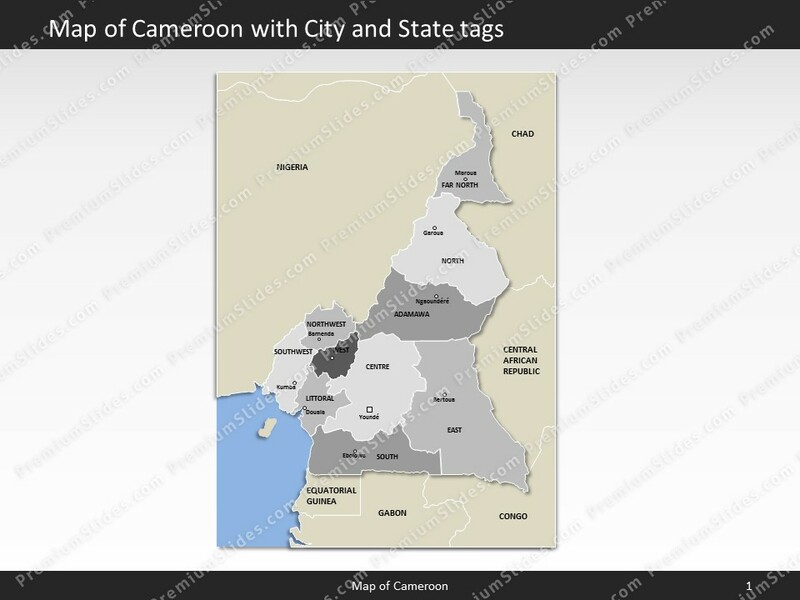 This detailed PowerPoint Map Template shows Cameroon with states names and biggest cities including the Cameroon capital.The Cameroon PowerPoint Map is hand drawn and fully editable in size and color. Every state can be extracted simply. Specific territories can be highlighted easily with just 2 clicks in PowerPoint. 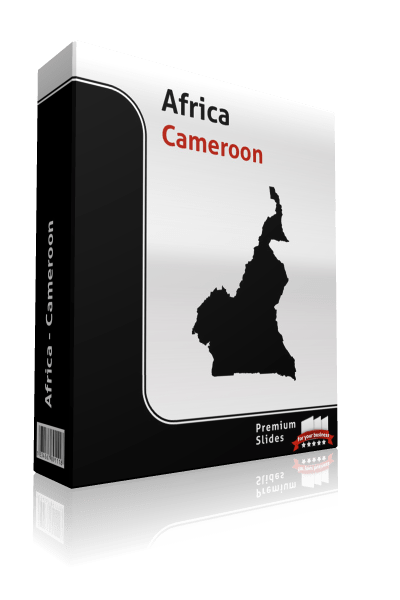 The extensive Map Guide, which is included in this package, shows the easy steps of adjusting the map to your needs.The Cameroon Map Template is a great benefit for showing different kind of data (e.g. sales) in this country. 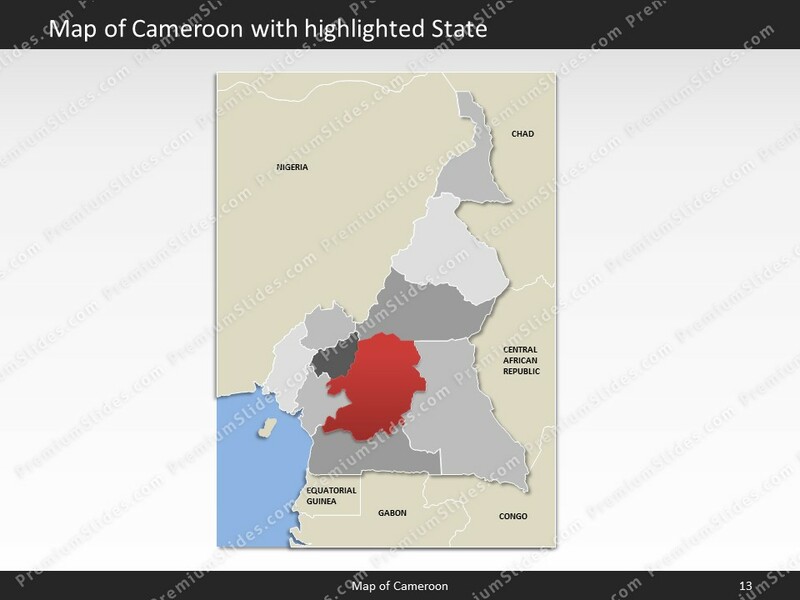 This Cameroon PowerPoint Map comes in 8 different pre-designed colors and includes map marker icons as well. 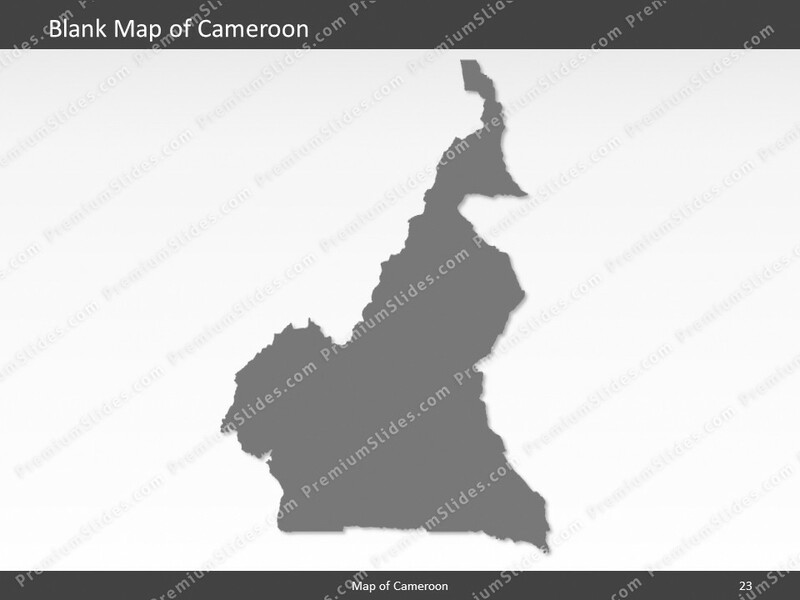 Facts and information about Cameroon you can use in your presentation. 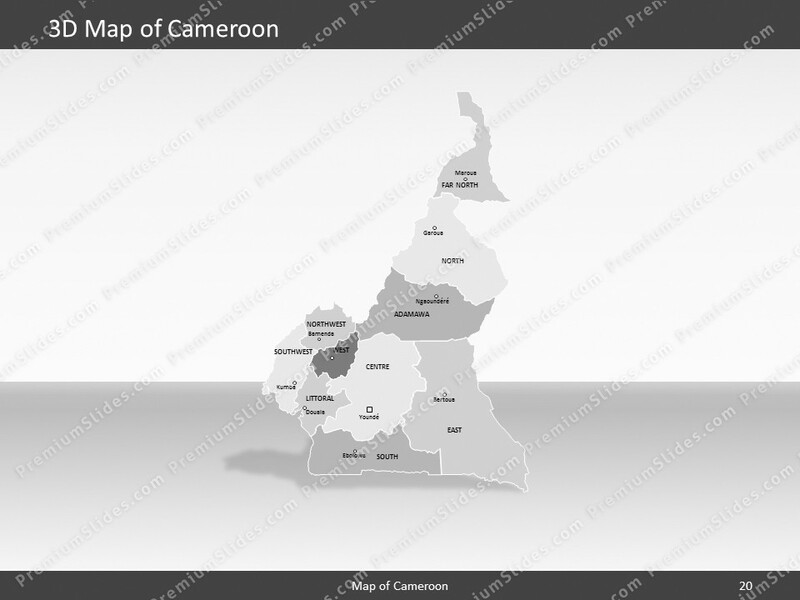 Cameroon is often referred to as Republic of Cameroon or simply Cameroon. 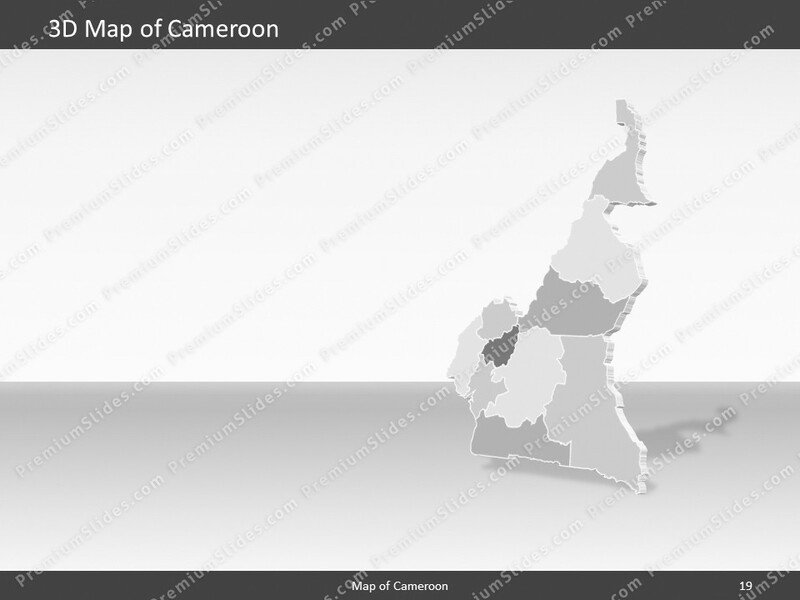 The locals also call the country Republique du Cameroun/Republic of Cameroon or Cameroun/Cameroon for short. In the 15th century, Portuguese explorers named the area near the mouth of the Wouri River the Rio dos Camaroes (River of Prawns) after the abundant shrimp in the water; over time the designation became Cameroon in English; this is the only instance where a country is named afer a crustacean. The country's flag has the colors green, red, yellow. 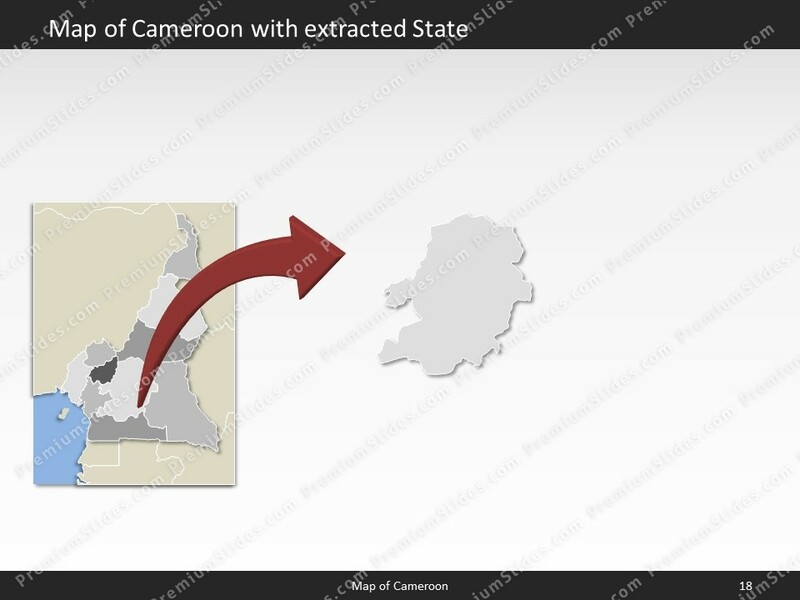 The country of Cameroon lies 6 00 north and 12 00 east. The region has a total area of 475,440 sq km with a land coverage of 472,710 sq km. About 2,730 sq km is covered with water. 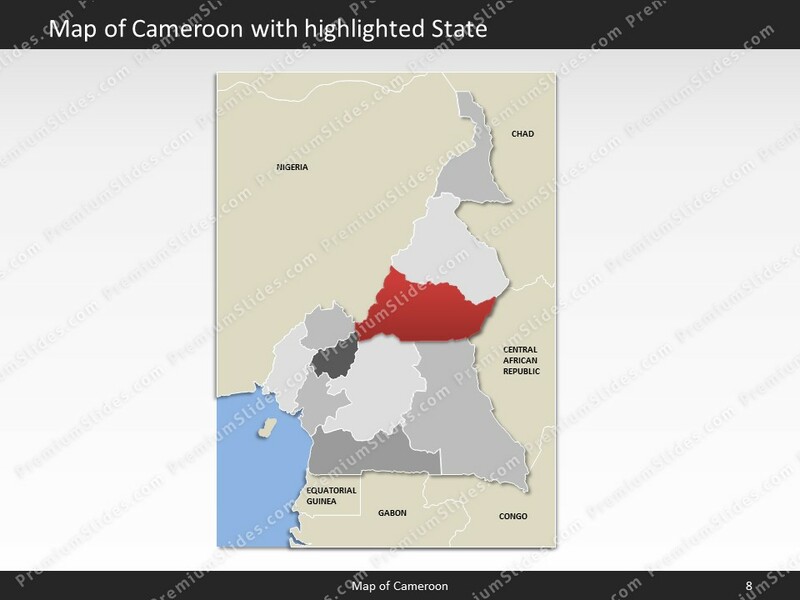 Cameroon has a total border lenght of 5,018 km and is bordered by the following 6 countries: Central African Republic 901 km, Chad 1,116 km, Republic of the Congo 494 km, Equatorial Guinea 183 km, Gabon 349 km, Nigeria 1,975 km. 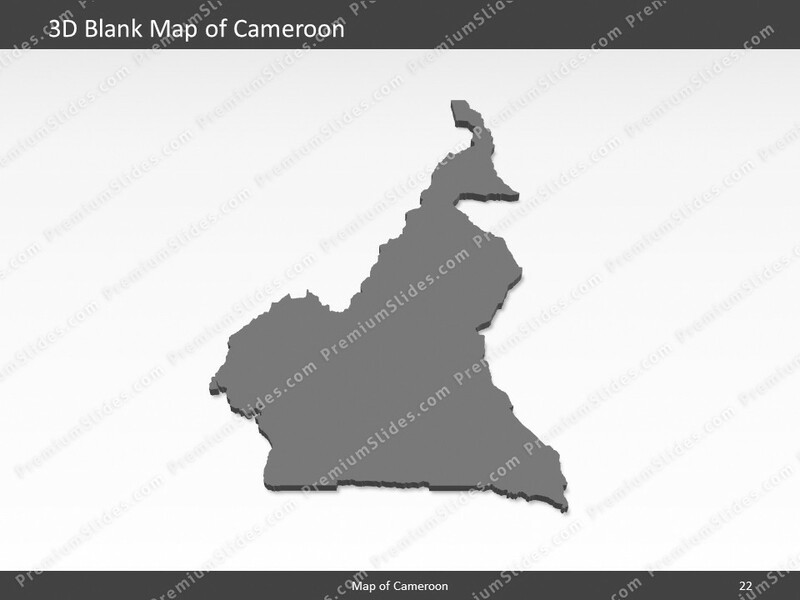 The lowest point is Atlantic Ocean 0 m below sea level and the highest is Fako 4,095 m (on Cameroon Mountain). 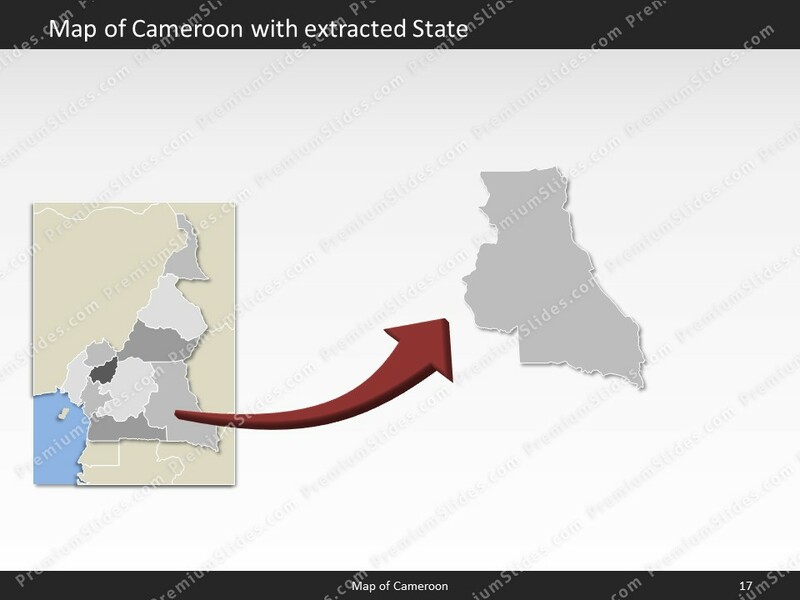 Its mean elevation is about 667 m. Yaounde is the capital of Cameroon and can be found 3 52 N, 11 31 E.
In July 2016 Cameroon had a population of 24360803people. In 2015, 54.4% of the population lived in cities. The annual growth rate of urbanization is 3.6%. 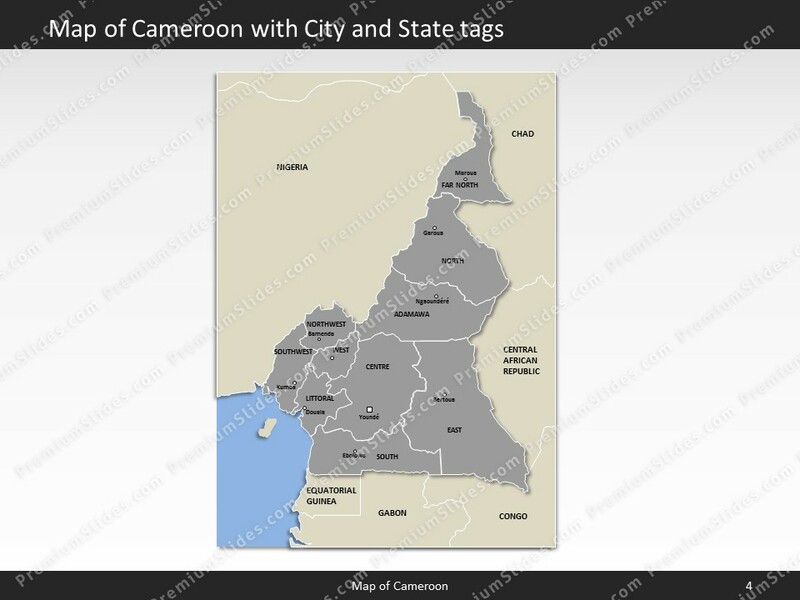 The residents of the country are called Cameroonian(s). 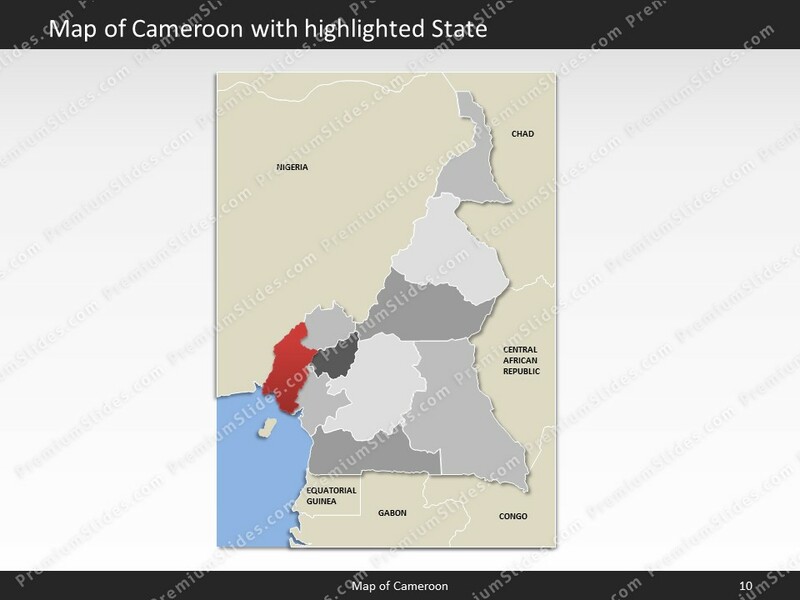 The Cameroonian population has a median age of 18.5 years. The median age for males in 2016 was 18.4 years, and 18.6 years for females. 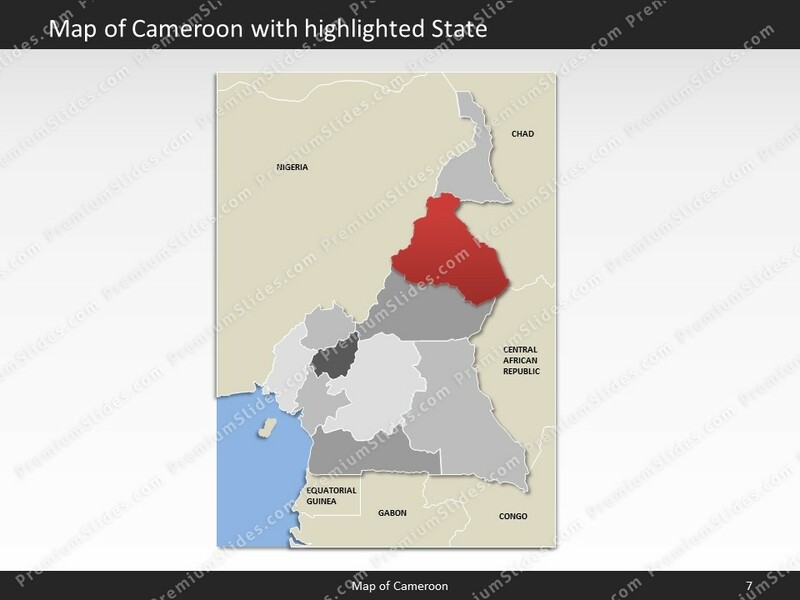 The estimated growth rate of the Cameroonian population in 2016 was 2.58%. 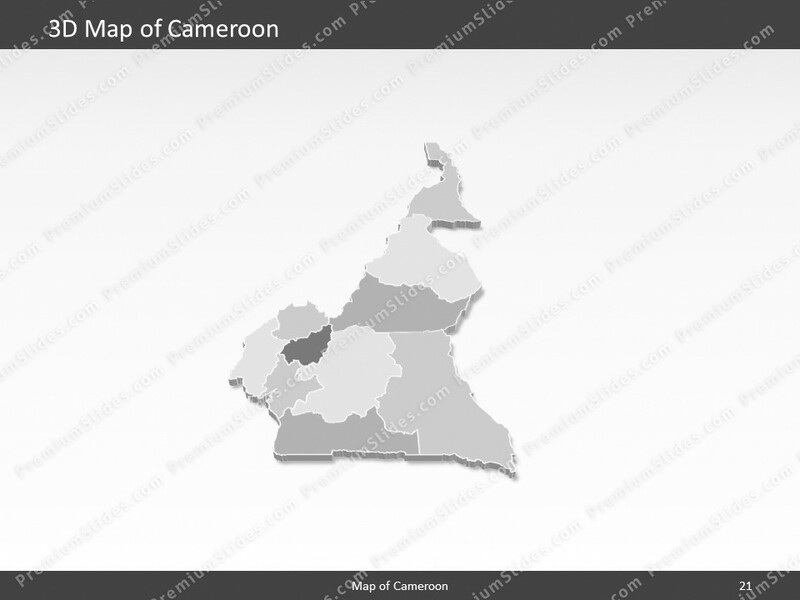 Looking at life expectancy, the Cameroonian people live an average of 58.5 years (males 57.1 years, females 59.9 years). Statistically, Cameroonian women give birth to 4.7 children in their lifetime. The estimated gross domestic product in 2015 was about $72.64 billion, with a growth rate of 5.9% compared to 2014 (GPD 2014: $68.61 billion, growth rate 5.9%; GPD 2013: $64.78 billion, growth rate 5.6%). 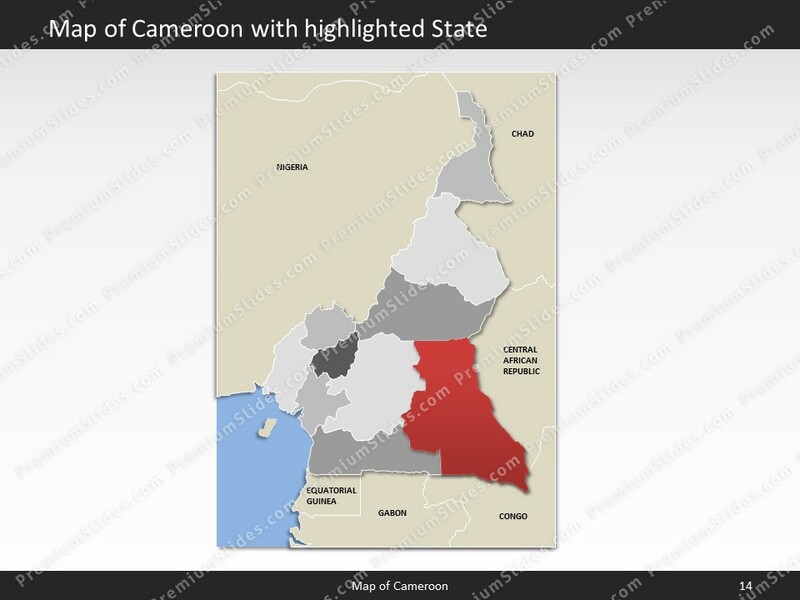 The economic sectors of Cameroon are: agriculture: 22.3%, industry: 29.9% and services: 47.9% (2015 est.). The country's economy is known for: petroleum production and refining, aluminum production, food processing, light consumer goods, textiles, lumber, ship repair. Only 55% (10.1 million) of the people living in Cameroon had full access to electricity in 2013 (rural population: 17%; urban population: 88%). Among those 20.7% (July 2015 est.) 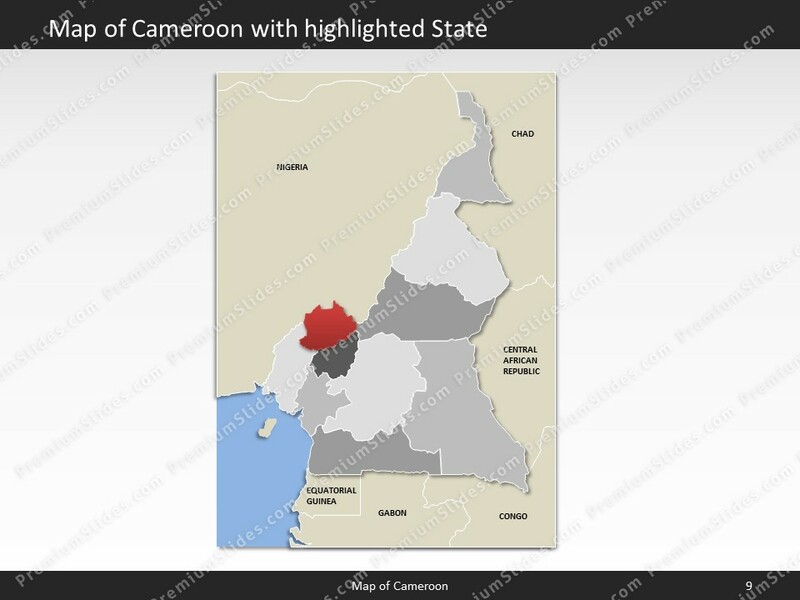 or 4.909 million Cameroonians, had access to an internet connection.